How S Bike Mode Works? 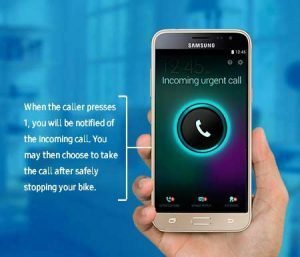 Considering the exponential increase in the number of two-wheeler riders in India and the road accidents resulting therefrom, Samsung has come up with an innovative smartphone feature named 'S bike mode' (presently available only on Samsung Galaxy J3). Let us see how this mode assists you to ride safely. Most of the times, it is seen that incoming calls & text message alerts tend to distract the riders while they are riding a bike. Such a distraction is very dangerous as the rider may lose concentration and may encounter an accident. To solve this problem, Samsung's Indian research and development center invented S bike mode. When this feature is ON, it prevents all the phone calls from generating an alert of any sort. Instead, caller hears a recorded message saying that the user is riding a bike and hence, is unable to receive the call. This is exactly the need of the hour as road safety is a major concern in India and particularly when the motorcycle accidents are on the rise. The working of this feature is based on one Near Field Communication (NFC) tag and an inbuilt app. NFC technology has earlier been put to use for payments via smartphones like the Google Wallet. S bike mode works only with the NFC tag supplied on the smartphone which can be attached to any suitable position as per the convenience of the rider. Generally preferred locations are the fuel tank or helmet as it helps in on-the-go activation. The S bike mode can be easily activated via single tap on this tag or via the app. After activation, you are free to ride uninterruptedly. Still, if the caller has to establish an emergency contact he can press one and continue the call. This feature is called urgent call alert system which is helpful in an emergency. In addition, the S bike mode provides one more feature called 'Motion Lock'. This feature doesn’t allow the rider to receive an emergency call while riding. Answering the call is allowed only when the bike stops completely. S bike mode helps the rider and the caller in a very meaningful way. For the rider-from the safety point of view-as he will not be distracted and as for the caller who will be aware of the reason behind an un-received call. It also brings the rider to a complete stop in case he wishes to receive the call. These features ensure safety of the rider and improve road safety. With the launch of such an innovative product, Samsung has certainly taken a step forward in ensuring the road safety in India.